Killing cones are shipped from our farm. *Scalders & pickers are drop-shipped from Nebraska. After ordering, allow 10-14 days for delivery. I received this information from the manufacturer on 4/1/2019. “All future products from us will be made with black powder coated parts instead of red. Our vendor recently stopped carrying red powder coat. There will be no change to the quality of the product.” When new pictures are available, they will be posted on this web page. Also note: Due to the flooding in Nebraska all fiberglass scalders are on back order. All other products are available and in stock. KC-2 - Turkey cone diameter 24” l in back & 11” l front. Diameter - top 15”; bottom 4”. The fiberglass scalder has a thermostat to maintain the water temperature under heavy use. The single element scalder has one 1500 Watt heat element and can heat water to 155º. The duel element scalder has 2 1500 Watt elements so that the water can heat faster. (You can choose to use only 1 element if you desire.) Dimensions: 18” square. The scalder holds app, 14 gallons of water. FSPM* - Hard white high density polyvinyl material is easy to clean. 28 rubber fingers remove feathers from chickens and other birds in as little as 30 seconds. Has high torque 1/6 hp motor that operates at 1725 RPM. 4 removable steel legs bolt to the sides. 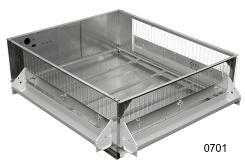 Dimensions: 33” h x 16” w x 42” l. Call for a shipping quote on scalders and pickers. Call us for replacement parts.